How to debug php artisan serve in PHPStorm? I am using PHPStorm for develop my PHP web pages. All work fine with my Apache Server, XDebug, and a simple web PHP project. No problem. I have configured all in PHPStorm (enabling remote debug, correct port, etc. ), and with "normal" PHP projects all works fine. Can someone tell me if I need to change something? Debugging using php artisan serve does not work unless you have enabled debugging in ini file. @Bogdan pointed out the reason. artisan serve will call PHP Built-in Web Server but does not pass on the php command line options (named interpreter options in PHPStorm). Then these options given by -d are not passed to called PHP Built-in Web server. You can see the calling of build-in server here. Check Use route script and select server.php in Laravel projects root directory. Now the PHPStorm will execute same command as php artisan serve does with additional interpreter options. Actually the php artisan serve only purpose is to append the server.php to PHP Build-In Web Server. server.php just emulates Apache's mod_rewrite functionality. Update: Good reminder from @attila-szeremi: make sure "Start Listening for PHP Debug Connections" is enabled which you manually need to do if you don't run a PhpStorm configuration with "Debug"
I don't use phpstorm, but perhaps the solution that I use for debugging in netbeans will prove useful. The only caveat for this, is that as long as you have this configured, it will impact other things that you use php cli for. Normally you need to use a specific HTTP GET/POST variable to start remote debugging (see Remote Debugging). When this setting is set to 1, Xdebug will always attempt to start a remote debugging session and try to connect to a client, even if the GET/POST/COOKIE variable was not present. So, after going through Jeffry's Be Awesome in PhpStorm, I had been stuck in a similar situation to the OP (in the chapter regarding Xdebug and Laravel). I was setting up the breakpoints, but PhpStorm was not able to break the execution according to those points. And, to be honest, Josh's answer here somewhat helped me to understand the problem, but was not clear enough for me. So, I went out and found the solution myself by hit and trial method, the final solution of which I want to share. May be it will come in handy for some folks still wondering. Firstly, as OP said/guessed, php artisan server does use another server. It is PHP's built in web server plus the server.php router file. And the configurations it uses are the CLI configurations. Try php --ini to find all the included configurations. Set Host as localhost, Port as 8000 and Debugger as Xdebug and leave any other check marks unchecked! From the drop down list of Server: select the one we just set up. Select the browser you prefer. Please remember that the debugger will only work after the actual web server starts, which is the server that starts with php artisan server command. Now, start the web server ie. 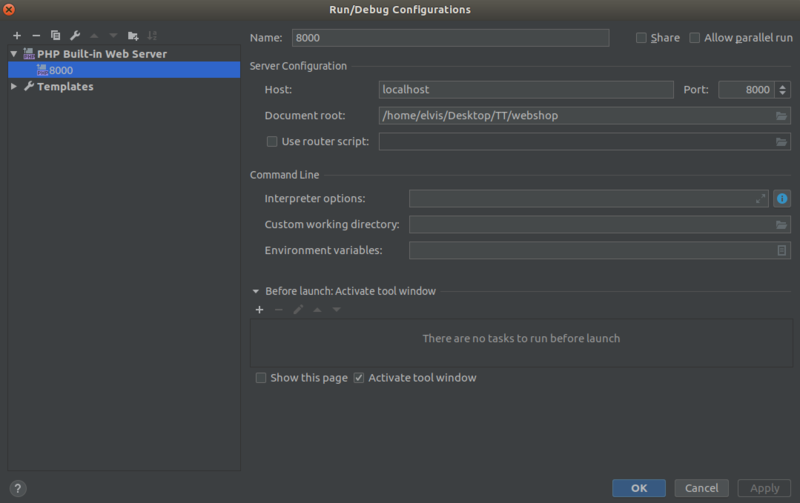 php artisan serve and in PhpStorm click Run > Debug 'your-debug-config', and everything should work fine! and click on phone icon to "Start listening for Xdebug connection"
Not the answer you're looking for? Browse other questions tagged php laravel phpstorm xdebug or ask your own question.